Italy’s national acrobatics flying team entertained Americans and Italians during a brief demonstration over Aviano Air Base in northeastern Italy Friday. 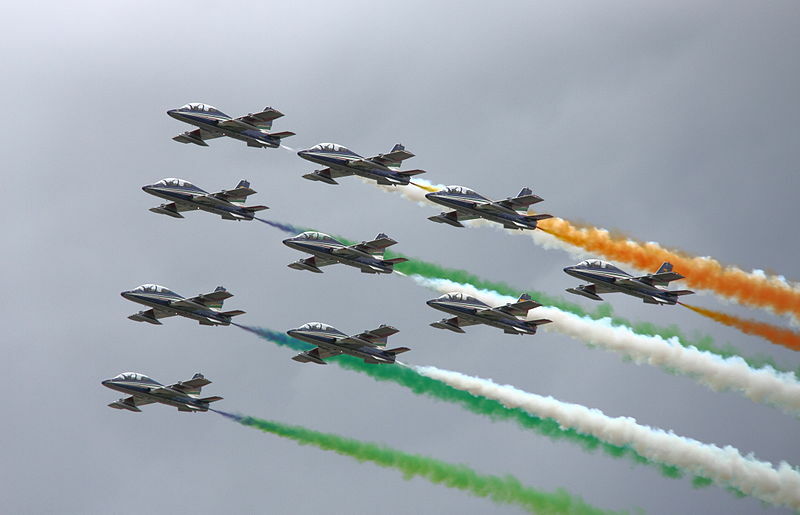 Frecce Tricolori is based at nearby Rivolto Air Base and performs at air shows around the world. It’s become a tradition for the team to provide a brief demonstration of its abilities over Aviano. The short demonstration included several maneuvers with the Aermacchi MB-339 jets producing white smoke that quickly blended with a haze over the nearby Dolomite mountains. They also demonstrated precision-flying techniques, individual maneuvers and a stunt where all of the team’s seven jets climbed high in the air before appearing to drift toward the earth like snowflakes. Dozens of Americans and Italians gathered both inside and outside the base to watch the display. For the complete story by Stars and Stripes, click here.